We’d love your help. Let us know what’s wrong with this preview of The Eden Conflict by Peter Way. The war between good and evil erupted long before mankind ever walked on this Earth. Since Adam took his first steps, Satan and his followers, the demons, have sought to destroy and control the souls of mankind. But the protectors of God’s creation are always close by. Who are they? They are the good and the just, they are the angels and the saints, they are… GOD’S WARRIOR The war between good and evil erupted long before mankind ever walked on this Earth. Since Adam took his first steps, Satan and his followers, the demons, have sought to destroy and control the souls of mankind. But the protectors of God’s creation are always close by. Who are they? They are the good and the just, they are the angels and the saints, they are… GOD’S WARRIORS! To ask other readers questions about The Eden Conflict, please sign up. Peter Way lives in Adelaide, South Australia. A father of 2, he enjoys Basketball and reading in his spare time. This Present Darkness by Frank Peretti inspired Peter to write his first novel, The Eden Conflict. 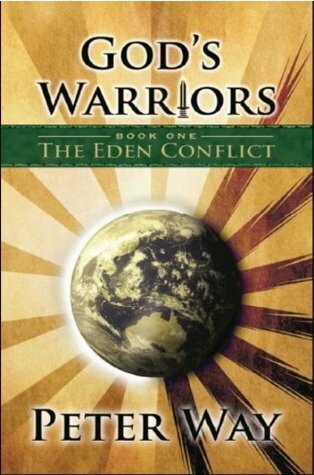 The Eden Conflict is book one in a series entitled God's Warriors. Peter also has other books planned and some started, most of which are Christian based, including fictional versions of ma Peter Way lives in Adelaide, South Australia. A father of 2, he enjoys Basketball and reading in his spare time.